Are you in the market for a used car? If yes you may be wondering about the best place to go. If you want to buy a used vehicle there are two approaches available. Should I Buy From a Dealer or Private Seller? Let’s find out. Private seller versus car dealer, which is better? On most car sales, you can either choose to search for a car from a dealer or private sale. Many car buyers believe that they can get a better deal at a private sale as compared to a dealer. However, there is usually more to consider other than just the price tag. If you are not well versed in the subject of cars then a dealer might be a better option. Here is what you need to know when buying a car from a dealership versus a private seller. Depending on where you live, cars that are older than 5 years need to be issued with what is called a roadworthy or safety certificate. This certificate indicates that the vehicle in question has passed a minimum safety standard inspection which normally includes steering brakes, windscreen, and operation of tires, lights, and suspension among other things. However, it is not a full mechanical inspection. If you are buying a car from a private seller, ensure that you discuss the car’s history and also ask to see the safety or roadworthy certificate. If you can, have a mechanic you trust to do a thorough check on the vehicle. While the car you tend to buy may look good in the exterior but what of the interior? Do you know what is happening under the bonnet? Keeping in mind that the most critical and usually expensive to repair parts are not clearly visible, you need what to look for. With this in mind, a private seller may not necessarily disclose any potential issues with the vehicle or even be aware of them for that matter. If you don’t know what an oil leak is or where the drive belt is you might want to bring along someone who does. When doing an inspection, ensure that you take notes on all the repairs you think the car might need. Let the seller know that you are going to be checking on the prices of these new parts and repairs as it might help you negotiate the price. Is it possible to buy a car without a license? Buying a car through a licensed car dealer means that the vehicle will be covered by a statutory warranty that guarantees that certain defects found after you purchase the car will be repaired within the warranty period. In addition, car dealerships may also be able to offer additional warranties which could be quite comforting if you are purchasing a used car. While it is hard to argue which one of this two is truly better, almost three-quarters of the average car buyer believe private sellers are dishonest with another huge percentage admitting to feeling unsafe when purchasing a car through them. Similarly, more than 80% of car buyers admit to feeling anxious or uncomfortable when dealing with car salespeople with more than half feeling pressured to buy something. First and foremost you need to cover the cost aspect of buying a used car because both a private seller and car dealership can lead to financial advantages over the other if you choose wisely. It is a sensible thing to think that you will get a better deal by buying a used car from a private seller. Besides, there are high chances that the seller is not a car expert thus they may not be fully aware of the car’s true value. The flip-side of this, however, is that the private seller might have an over-inflated sense of what their car is really worth thus setting an equally over-inflated price. With a private seller, you have a better chance of negotiating a better price and you can always walk away if they are not willing to play ball. Since they may be eager to sell the car quickly, private sellers may also be less patient. For instance, they may be in dire need of money or moving overseas. This puts you in a better position to bargain the price. It is also crucial that you check if there is any encumbrance on the vehicle if you intend to buy it from a private seller. This is to check that there is no debt on it. Avoid buying an encumbered car because if the previous owner is to default on their debt payments, their lender could repossess the vehicle even if it is in your hands despite the debt not being yours. While it is slightly unethical for a car owner to advertise their car for sale when they still owe a car loan, it is not illegal. Therefore you need to check the vehicles register number online to see if an encumbrance is reported on the register. If it has, you can contact the lender and see if the private seller has competed repaying the debt. In the event that the car has an existing debt and you still want to buy it, ensure that you arrange for the sale transaction to take place in the lender’s office where they can confirm that you encumbered ownership of the car. Buying a vehicle from a car dealer is usually more expensive than buying it from a private seller. This is because car dealers often have cost margins to cover such as wages and rent. Therefore, they might slightly boost the price of the car to compensate for this. However, the quality of customer service and professionalism at a car dealership may be worth the cost of the car. Therefore, while the price of a car dealer might be more pricy as compared to a private seller, you have the surety that the car you have bought will not die on you minutes after you take it on the road. To make the most of a car dealer, do proper research and compare prices across other dealerships. Just like private sellers, you can also bargain the price with your car dealer and if you are not happy with what they are offering then take your business elsewhere. Getting a good bargain on a used car is not the only part of the equation. You also need to make sure that you are getting a vehicle that is in good condition and if it is not then your seller should at least disclose this vital information to you. By purchasing a used car from a private seller, you may be sacrificing peace of mind for a cheap price. While you are likely to find someone who has done their due diligence and properly valued the vehicle based on its current condition, there are some of those who have no clue on what’s going on inside or outside the car. Also, keep in mind that there are those who just like you want to get the best offer so they might try to sell you a car at an overvalued price. The inside – Are the seat belts, lights and other accessories working? How is the wear and tear on the carpets and seats? The outside – Are there any damages to the panels or tires? How is the pain job? Are there any broken windows or oil leaks? Under the bonnet – Are there any signs of damage or corrosion on the battery, radiator cap or cooling fans? Does the compliance plate correspond to the build date? You should never assume that a private seller is being 100% honest with you even if you know them personally. Consider the possibility that they might not even know all of these things about their car. However, it is vital that you know these things before you proceed with the purchase. All in all, if you are well informed then there is a good chance that you may find a carefully, driven and regularly serviced vehicle for a good price through a private seller. 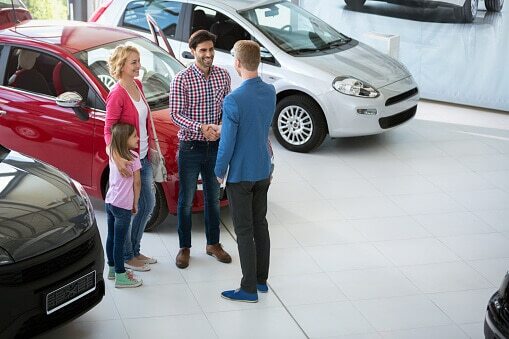 Someone who loves their car is less likely to part with it for a low trade-in price at the dealership if they could get a better offer by selling it by themselves. Therefore, you can get a great value privately-listed car if you know where to look. While buying a vehicle from a car dealer might be more expensive, you might want to consider the price you are paying for the reliability and peace of mind you will be getting. Vehicles that are sold through licensed car dealerships are typically less likely to break down soon after the date of purchase. In the vent that they do break down, the repairs are covered by the statutory warranty that guarantees repairs for the affected parts for the agreed period of time. In addition to this, car dealers are responsible for removing any encumbrances from cars before they are sold. Therefore, you don’t have to worry about your vehicle being repossessed due to an unpaid debt that you don’t even owe. With a car dealer, you can be confident in the safety of the vehicle. However, there may be a bit of grey area in regards to trusting the car dealer. This is because they have been known to overcharge for extras that you may not need such as roof racks, extended warranties and rustproofing among other things. There is also the possibility of your dealer trying to outright sting you by overpricing the car. To combat this, however, you need to arm yourself with information on the market pricing of the car. There are websites online that do this. As you have seen there are certain financial pitfalls to both private sellers and car dealer. You could either end up paying way too much money after being fleeced by a car salesperson or wasting money on a car that breaks down the very moment you have put your name on it. As long as you do your due diligence, a private seller cab offer a better opportunity to save big money. This includes checking for pricing online, conducting background checks for any outstanding debts or write-offs and arranging for a professional inspection of the vehicle. But, going with a car dealership may be the safer option especially if you don’t know much about cars. Buying a car from either a private seller or car dealer has both pros and cons, but with the information above you should be in a better position to decide which of the two you will go with. Best of Luck!